Please take your time to read through this section on the RTCU M2M Platform and you will realize that we are offering a product based on a concept that is second to none on the market today! And we are constantly expanding our products with new features and new variants. 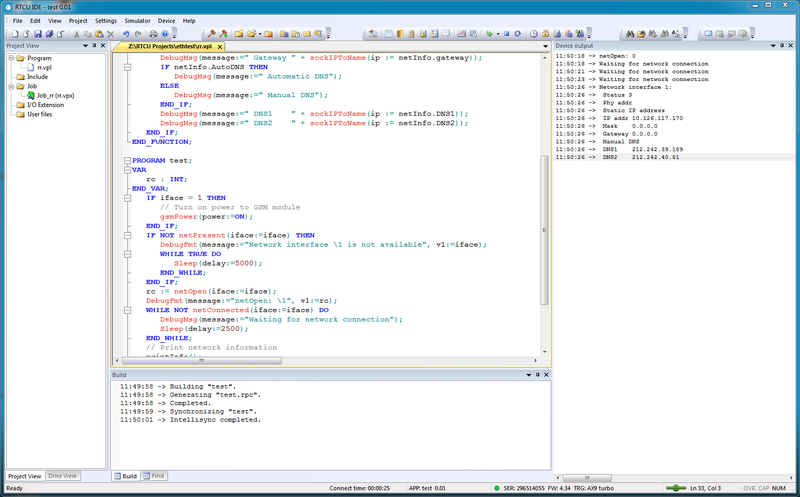 Powerful RTCU IDE - Integrated Development Environment-, with full featured RTCU Emulator. The RTCU concept rests on a well engineered architecture that has been refined by our customers feedback over the last 16 years, and therefore we can today enjoy a state-of-the-art platform, that be easily deployed and maintained by our customers with the lowest possible affords and cost. 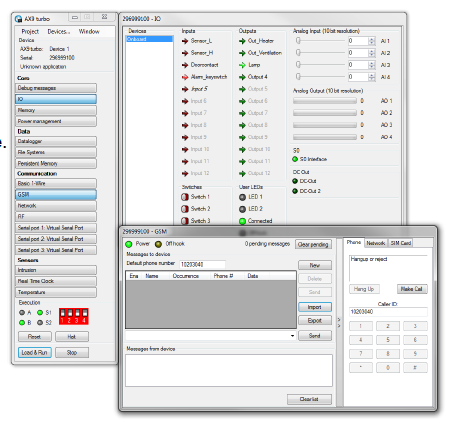 Hardware independency is demonstrated by the fact that a program written once can execute on any RTCU device - including the RTCU Emulator - without any changes or additional testing. Offering future proof product is of high priority for us to protect our customers investment in development / debugging applications. A good example is a program written for our first product in the year 2000 (early days of GSM Telemetry!) using simple SMS messages today can run unmodified on our latest product line communicating over UMTS / GPRS, LAN or Wi-Fi! Many things changes in the meantime, including: Different communication method (SMS versus UMTS), New CPU architecture introduced (16 versus 32 bit) and the customer may have changed GSM operator or geographical location. Everything is handled within the RTCU concept, so the legacy software developed for 8..10 years ago still works without any problems! 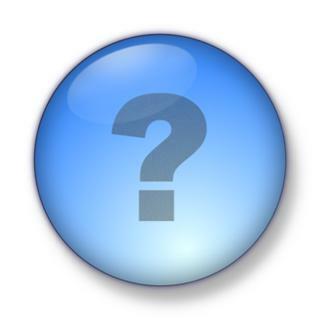 When comparing products the actual Cost of ownership must be carefully examined and considered. Above the advanced architecture used by the RTCU concept is pictured. As it can be seen, it is a well designed layered structure with a boot-loader / monitor just above the actual hardware. The Boot loader / monitor is a simple components that allows communication with the unit over a physical cable or CSD - even if the main-firmware has been lost. The green part with the MPK Real-time Operating System in the bottom is the actual firmware. On-top of the firmware the TCP/IP stack, the VPL Virtual Machine and the various hardware drivers resides. On top of the firmware (the green part) the customer application is running. 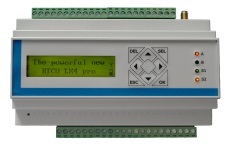 The firmware as well as the application can be upgraded using a cable connection or over the air with a Gateway TCP/IP connection. The RTCU Emulator is an virtual execution environment that precisely emulates all current RTCU devices. 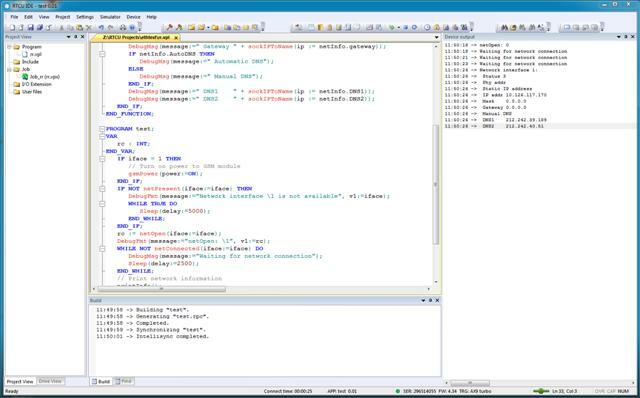 The RTCU Emulator canbe used as a stand-alone tool or it can be integrated swiftly into the RTCU IDE in order to make coding and test tightly connected. The RTCU Emulator is based on the same source code as the actual RTCU device firmware. Almost all features and the behavior of each and every physical device are precisely emulated. This ensures a precise emulation with only a few limitations. Multiple devices with separate instance state. Device file-system using VHD files. Remote access over the RTCU Gateway. Logic IO was one of the first with GPRS support in the world and has a large working experience from 100+ cellular networks. As it can be seen from the architecture earlier, we are using our own highly optimized and tuned TCP/IP stack, in contrast with the simple use of the GSM modules under-featured TCP/IP stack. Applications only handle application domain problems! Independent of global/local- dynamic/static IP-addresses, firewall configuration etc. Handles all network related issues. Lowers the cost of communication without software changes! The RTCU Deployment Server offers important functionality for deployment and maintenance of even the largest installations of RTCU units. Seamless upgrade of application as well firmware take place automatically without user intervention or unit operating interruptions minimizing the cost and impact, when new software releases are to be deployed. Free add-on to the RTCU Gateway. This was a short introduction to the RTCU Concept, its architecture and the various main components which defines this powerful, versatile and future proof platform. Please take a closer and more detailed look at the various pages on our web-site including the list of products available. 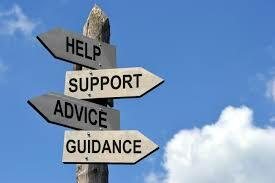 Also do not hesitate to contact us for any questions which may arise during the jorney..